Boundless in ability and creativity, Obina is also a licensed esthetician with New York State certification from Aveda-Carsten Institute with more than thirteen years of sales. She has now Transfer her experiences into a new world of skin-care . Her healing Hand are most talked about custom facials that includes a mini massage, Aroma-therapy, deep-pore cleansing are just a few of the services Obina renders at LA BELLE BOUTIQUE in Clinton Hill, Brooklyn, Committed to her clients looking and feeling their best, Obina only uses all natural and organic skin-care products and also have handmade skincare line called DAILY REGIMEN. Simple regimen for lazy people want radiant skin. Get a personalized skin coaching to help maintaining radiant skincare at home. ​The best skin care regimen is one based on sound principles that include effective ingredient. I am a strong believer in simple. Daily Regimen is for all skin type. Made by hand. Daily Regimen natural products are: hypoallergenic, hormone free, artificial fragrance free, artificial colorings free, non-comedonic, non-acneogenic and won't clog pores. Our products are all natural, organic, rich in vitamins, minerals, enzymes, amino acids, and contain antioxidants. There should be a good at-home skin care regimen and there should be a skin care program in place outside the home and supervised by skin care professionals at a medical spa. For keeping your skin in proper condition, it is necessary to make a daily skin care regimen to pamper, and preclude damage to your skin. Do away with the everyday buildup which comes from oil and other cosmetic products. Generally, a non-abrasive cleaner would serve this purpose really well. Harsher cleansers would just lead to unneeded breakouts and inflammation throughout the cleaning procedure.Uneven skin complexion is a very general problem for a majority of Afro Americans. Use a specialized product for hyperpigmentation which would finally brighten the dark spots, giving your skin an even tone. Get rid of the dullness from the skin by choosing a soft exfoliating product which will take away the dead cells that are responsible for making the skin flat and lifeless. Step 1: Cleansing. Simple is key here. You need to find a good cleanser that your skin responds well to, and stick with it. Avoid bar soaps as they tend to dry out the skin. Most cleansers contain oil, water and "surfactants." The oil dissolves oil on your face, surfactants dissolve dirt and makeup and the water washes it all away. The secret is finding the right mix of oil. Too much on your skin will clog pores, while too little will dry it out. This is why you need to know your skin type. Never wash your face with hot or cold water (both can cause broken capillaries). Also be careful about over-cleansing your skin. Use a dime-sized SWEET ORANGE + LAVENDER Cleanser, then rinse with cool or lukewarm water. Cleanser is also a proper makeup remover. Step 2: Exfoliate and Tone. Exfoliation is the step most people skip in their weekly skincare routine. But trust me, if you start properly exfoliating your skin, you will notice an almost immediate difference. Scrubs work by removing the top layer of dead skin cells that tend to dull your complexion. We find exfoliating skin once a week keeps skin glowing year-round. Make sure you use Pumpkin Enzyme Masque, Gentle Scrub with tiny grains. Using an Aloe + Green Tea Tone is a great way to minimize pore size and refresh your skin after exfoliation. 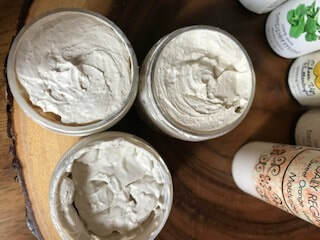 ​SWEET ORANGE + LAVENDER moisturizers. So how much should you moisturize? Your skin will tell you. When your skin is tight, it's crying out for moisture. Be careful not to over-moisturize, this can cause clogged pores. Though sun block and sunscreen almost sound similar, it is different when it comes to its functions. A sun block basically blocks the sun's ultraviolet radiation and sunscreen, on the other hand, reflects or absorbs the rays exposed to sunlight. Always choose a sunscreen that has a broad spectrum. These protect your skin, not just from ultraviolet A rays, but also from ultraviolet B rays. Sunscreens should be applied every two hours as they don't tend to remain for longer duration on the skin, not even the ones with an SPF of 45 or higher. People with sensitive skin must stay away from creams that are rich in fragrance, preservatives and dyes. Type 1: Oily skin tends to be shiny with enlarged pores, and is prone to blackheads and blemishes. You might experience some tightness. Type 2: Combination skin type has medium pores, a smooth and even texture, good circulation, healthy color, may tend toward dryness on the cheeks while being oily in the T-zone. Type 3: Normal /Sensitive skin tends to be thin, delicate with fine pores. It flushes easily, is prone to broken capillaries, is frequently allergic and can be rashy. We would love to work with you on wholesale, private labeling or custom orders. Please complete the form below with your specific request and we will quickly get back to you.